Forget take out! 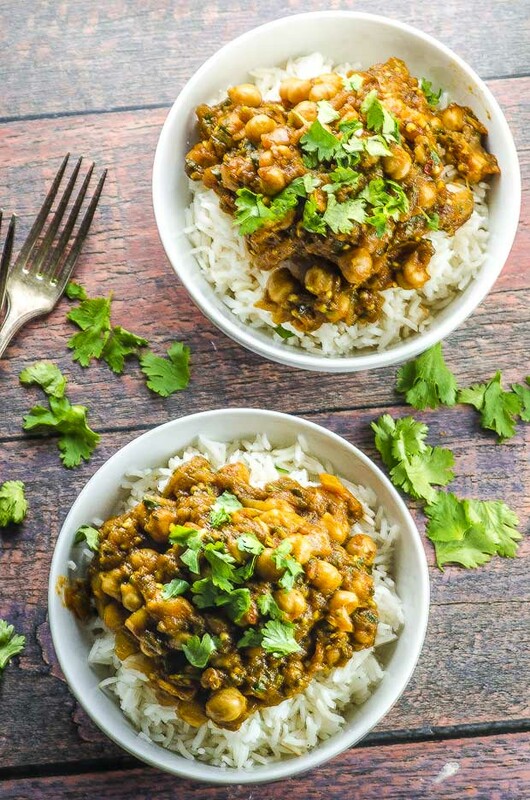 Bring the delicious flavors of your favorite Indian restaurant to your home with this super flavorful vegan eggplant and chickpea curry. Loaded with spices and incredibly easy to prepare. We absolutely love Indian cuisine. No surprise there, since we’re admittedly spice addicts… Unfortunately, recreating the same amazing flavors authentic Indian dishes have, is quite a challenge. A lot of times, the spices and ingredients that these recipes call for, are pretty hard to find. If you like a creamier, richer sauce, you can add coconut milk, just like we did for our Braised Curried Kale recipe.You can use other vegetables as well, such as cauliflower or sweet potatoes. Just make sure to cook them until tender before adding them to the sauce. Add the cooked eggplant and broth or water, bring to a boil, cover the pan and reduce the heat to simmer for 40 minutes Add the cilantro in the last 10 minutes of cooking, saving some for garnish. 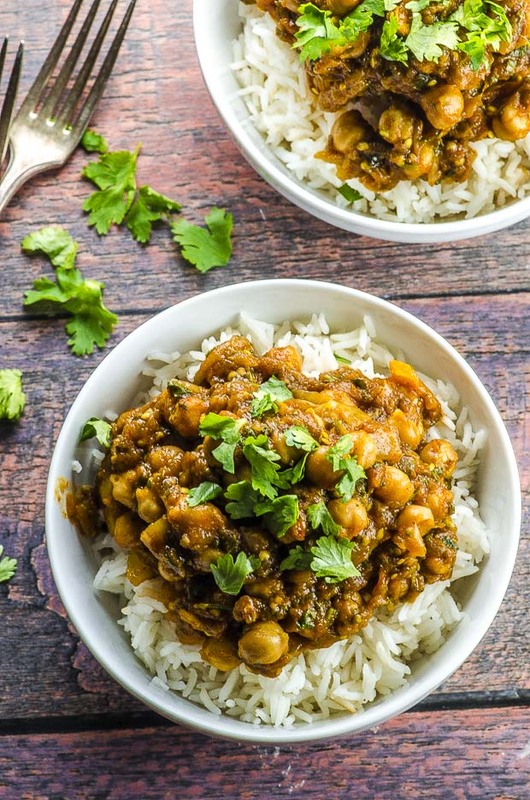 Did you like this Eggpplant and Chickpea Curry recipe? Share it! You didn’t? Tell us why! You want to make it, but you have questions? We’re here to help! Connect with us via Instagram, Twitter , Pinterest or Facebook or simply leave us a comment here. We want to get to know you! Thank you! We are so happy you enjoyed this dish. I made this for dinner last night and it was a huge success, there were no leftovers (which is always a good sign in my house!) Thank you for sharing the recipe! At what step would you add in the optional coconut milk? Add it 10 minutes before you are done cooking the dish. Hi, is the eggplant cooked ‘dry’ in the pan for 7 minutes? The recipe doesn’t mention using oil or broth at this step. Hi, cooking the eggplant dry in the pan, it kind of sears it and keeps its shape. You certainly don’t have to do that. You can always add the eggplant to the sauce, but it will fall apart into the sauce, which is not such a bad thing. Especially if you are in a hurry.